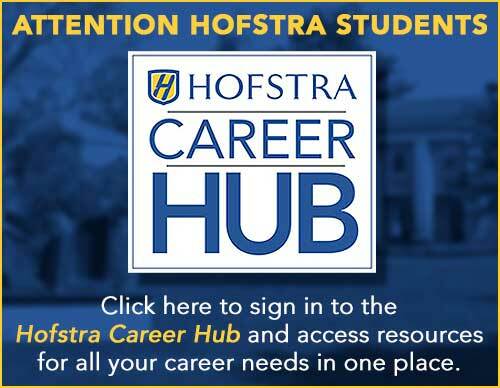 The Hofstra University Career Center is a team of professionals who put students first. We achieve our vision of empowering all Hofstra students toward meaningful careers and lives through one-on-one appointments for career counseling available in person, via Skype, and telephone anytime the university is open. Alumni can call 516-463-6060 and students can call or schedule online via CONNECT in the Hofstra portal. Have a Quick Question for our team? Come in to The Career Center on Tuesdays and Thursdays from 3:30-4:30 and Wednesdays from 11-1 -- no appointment needed! The Career Center will be on-site around campus on select days and locations, too -- view more details here! Topics covered in career counseling can range from uncovering your strengths, to making decisions about experiential learning (including internships, study abroad, on-campus experiences, etc. ), to searching for a major and/or career path, to making changes in your chosen career or major, to preparing to tell your story on a job search or in graduate school applications (including interviewing, resume, cover letters, applications, and more). We also partner to provide programming for the entire campus that empowers Hofstra Students to uncover their strengths, determine their path, and tell their story. If your organization would like to partner with the Career Center, call us or submit a program request. Once you are ready to share your strengths and tell your story, the Career Center facilitates connections with employers both online via Handshake and in person at Career Fairs, On Campus Recruiting, Information Sessions, Service Networking, and other creative events . Are you a student with a question about harassment?